There is a band - Everything But The Girl, named after a wedding shop that provide's everything but the Bride-to-be for the perfect occasion. This is a non-dairy smoothie called Everything But The Cow. Now - either this is a name inspired by a wedding to someone that you really don't like, or they are providing everything that you need for a smoothie - but you have to provide your own cow. 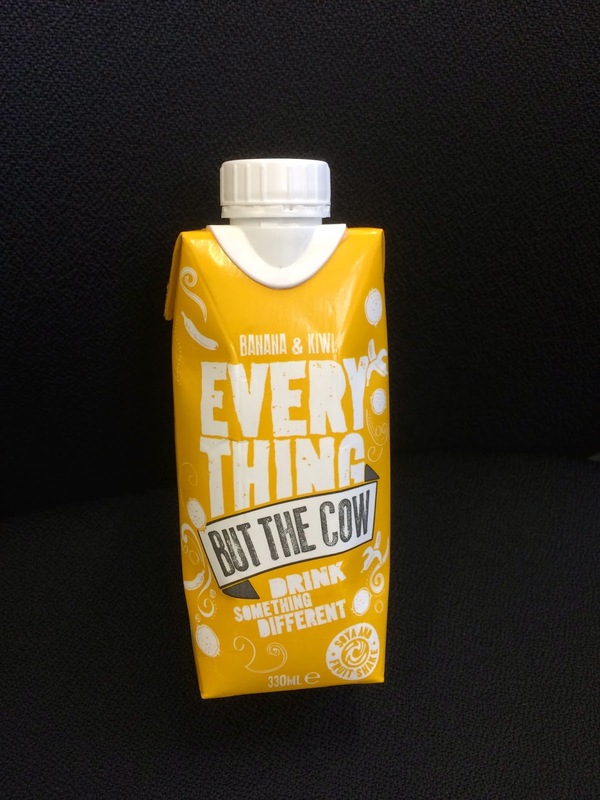 Maybe it's just me - I've never had to use a cow to make a smoothie, I get the milk from a third party, but also they have given us everything that we need as this is a complete drink. I mean I get the intentions behind the name, and it's probably what made me pick it up, but it kinda doesn't work if you overthink it (which I tend to do). That said here is the drink! I've moved offices so this marks the debut of the new black office chair being used for the background instead of the lovely green one that I used before. The products kind of look like they are floating in space though so I'm liking it at the moment. What we have here is a banana and kiwi smoothie, but not. 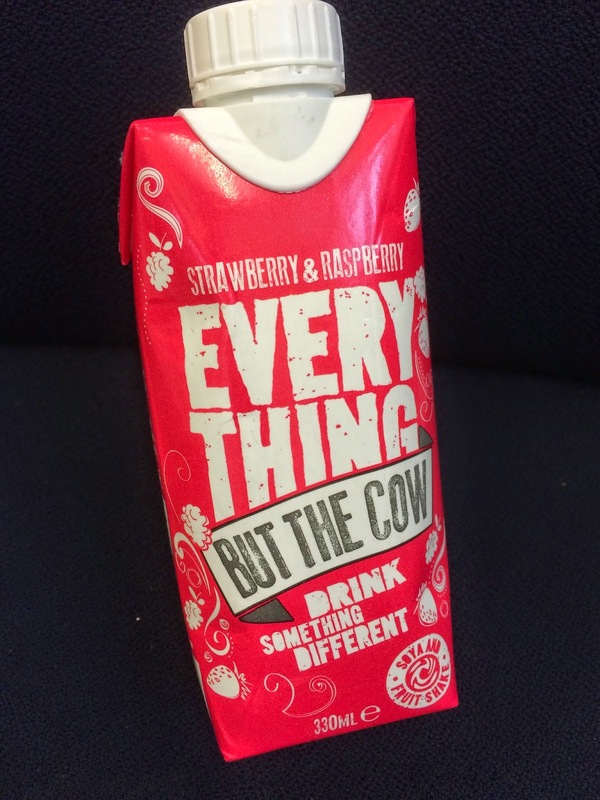 As we explained at the start this is dairy free, but still manages not to quite be a fruit juice drink. Thanks to some clever blending and the addition of a touch of soya this does genuinely feel more like a smoothie. The flavours on offer were also pretty interesting but I decided to pair them up as there are a lot of products to get through at this time of the year. First up we have Banana and Kiwi. A lot of people are not fans of banana in drinks but I'm OK with it, especially when there is enough additional flavour to make it work. Here the sharpness of the kiwi gives it a much needed fruitiness and keeps it interesting. The texture is smoothie like (definitely not a 'thickie' but not a fruit juice) and it had the desired effect of staving off the afternoon snack cravings. Next up on the interstellar voyage we have the Strawberry and Raspberry variety. Regular readers will know that the red flavoured berries are my favourite and here it's no exception. It's a bit sweeter and just has that lovely summer flavour that you get from a good blend. I'd choose this one again first, but if it was sold out I'd not hesitate to pick up the banana version. They are different enough from a smoothie to be their own product, and I guess the name explains this slot quite well. My only complaint if you can call it that was that they both seemed to end too soon. I'd have happily drunk a 500ml version of this - 330ml didn't last quite long enough. I approve of the clever and distinct packaging and once opened it passed the shake test so I'll happily buy more when out shopping. The nice lady from Holland and Barrett said she had a chat with the lady whose company it is when they visited the store and it seems to be going well for the brand. Hopefully it'll appear in more places and with more flavours to try. As nice as Innocent Smoothies are it's great to see some smaller companies making a niche for themselves. And - despite having a look at this 90s Dance playlist - I can't come up with a better pop-culture pun that says this product is dairy free than the name they went with, so they win on all fronts.